The purpose of this Sample Question Set is to provide you with information about the CompTIA Cybersecurity Analyst exam. These sample questions will make you very familiar with both the type and the difficulty level of the questions on the CS0-001 certification test. To get familiar with real exam environment, we suggest you try our Sample CompTIA CySA+ Certification Practice Exam. This sample practice exam gives you the feeling of reality and is a clue to the questions asked in the actual CompTIA Cybersecurity Analyst (CySA+) certification exam. These sample questions are simple and basic questions that represent likeness to the real CompTIA CS0-001 exam questions. To assess your readiness and performance with real time scenario based questions, we suggest you prepare with our Premium CompTIA CySA+ Certification Practice Exam. When you solve real time scenario based questions practically, you come across many difficulties that give you an opportunity to improve. 01. During a Fagan code inspection, which process can redirect to the planning stage? 02. Who is the best facilitator for a post-incident lessons-learned session? 03. A cross-site scripting attack is an example of what type of threat vector? 04. Which of the following is a switch attack? 05. Susan has been asked to identify the applications that start when a Windows system does. Where should she look first? 06. What organization manages the global IP address space? 07. How many phases does the Spiral model cycle through? 08. Which one of the following is an example of a computer security incident? 09. Using the Agile sprint process, what step will occur at step 2 in the previous graphic? 10. The Dirty COW attack is an example of what type of vulnerability? 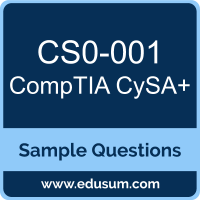 Note: For any error in CompTIA Cybersecurity Analyst (CySA+) (CS0-001) certification exam sample questions, please update us by writing an email on feedback@edusum.com.